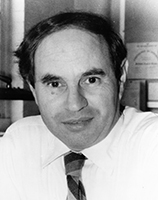 Leonard Mandel was Lee Dubridge Professor Emeritus of Physics and Optics at the University of Rochester (1964-2001). Other institutional affiliations included Imperial College London and Imperial Chemical Industries, Ltd. His research interests included quantum optics and laser physics. May 9, 1927Birth, Berlin (Germany). 1947Obtained BSc, Birkbeck College, University of London, London (England). 1948Obtained BSc, Birkbeck College, University of London, London (England). 1951Obtained PhD in Physics, Birkbeck College, University of London, London (England). 1951 – 1954Technical Officer, Imperial Chemical Industries, Ltd.
1954 – 1964Lecturer in Physics, Imperial College London, London (England). 1964 – 2001Professor of Physics (1964-1994); Lee DuBridge Professor of Physics and Optics (1994-2000); and Lee DuBridge Professor Emeritus of Physics and Optics (2000-2001), University of Rochester, Rochester (N.Y.). 2001Member, National Academy of Sciences. February 9, 2001Death, Pittsfield (N.Y.). PhD advisor at Birkbeck College, University of London. Advised by Mandel at University of Rochester, "Investigations of resonance fluorescence." Advised by Mandel at University of Rochester, "Investigation of non-classical states of atoms and photons." Both employed at University of Rochester. Professor of Physics; Lee DuBridge Professor of Physics and Optics; and Lee DuBridge Professor Emeritus of Physics and Optics. Obtained BSc (1947 and 1948) and PhD in Physics (1951). Leonard Mandel and experimental tests of quantum mechanics : a talk for the American Physical Society, Forum on the History of Physics, 16 April 2005. Oral history interview with Leonard Mandel, 1984 September 24. Symposium honoring Lee Alvin DuBridge [sound recording] / 1984 September 21-22. Interference: questions and answers with Harry Paul, 2010. Selected papers on coherence and fluctuations of light, with bibliography / Edited by L. Mandel and E. Wolf. Leonard Mandel New York Times obituary. Leonard Mandel Physics Today obituary. Leonard Mandel University of Rochester obituary.